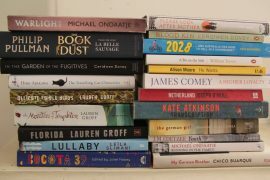 As would be expected, writers like Barbara Kinsolver, Michele Roberts, Hilary Mantel, Kate Atkinson, AM Holmes and Zadie Smith all make it. But there are also some intriguing less well-known writers, like Bonnie Nadzam, whose Lamb I am currently enjoying, and Maria Semple’s intriguing Where’d You Go Bernadette. This award was, until last year, sponsored by Orange. When the company pulled out a number of organisations tried to step in but the current competition, with a top prize of GBP30,000, is privately, and anonymously, funded.